Thanks to a petition backed by The Sun newspaper and signed by 107,000 people, the Sergeant from the SAS had his sentence suspended which meant he could spend Christmas with his family. Santa’s Lapland and The Sun teamed up together to offer the Nightingale family an amazing Christmas holiday here in my homeland of Lapland and they came all the way from their home in Cheshire to come and find me. "DAY ONE Despite an early start at Gatwick – the air hostesses made sure we were wide awake on the plane with lots fun and games for the kids on the plane. Once we landed in snowy Ivalo we were greeted by a bunch of naughty elves who kept the girls entertained as we waited for the luggage to arrive. Mara and Alys loved the elves – who kept making them giggle by pretending to steel their hats and playing other tricks. Our friendly rep Rachel welcomed on to the bus – after we said a quick hello to the reindeer waiting outside the airport for us. Then some Christmas carol singing on the bus got us in the festive mood as we traveled through the magical Lapland scenery to our resort Saariselkä. There we get kitted out with special thermal suits, boots, hats and gloves that make us all feel toasty despite the minutes 20 temperatures. We grabbed some food at our hotel Santa’s Tunturi and head out for some fun in the snow. Then after sledging and snowball fights we all got our heads down ready for our encounter with Santa the next day. DAY TWO After a hearty buffet breakfast we got on a coach and headed to the activity centre around 30 minutes from the resort. There was loads to do at the centre – skidoo rides, ice hockey, tobogganing – and each family got a reindeer sleigh ride, a husky dog ride and a magical sleigh ride, so the kids didn’t know where to start! On our husky ride we zoomed through the forest drawn by a pack of five barking husky dogs. The kids loved it – and even got to pat the dogs afterwards when they had run off a bit of their energy. The reindeer ride was just magical – we wrapped up in warm blankets and got pulled through the now to the elves’ magical workshop – housed in an igloo. While the kids were entertained by the elves’ singing and dancing the mums and dads can relax with a Baileys or a hot chocolate in the neighboring igloo – which houses an spectacular ice bar complete with ice sculptures. But the highlight of the day was the magical snowmobile ride – which took us to Santa’s secret hideout. The elves led us into Santa’s grotto where the girls’ Christmas lists have been magically transported before us. 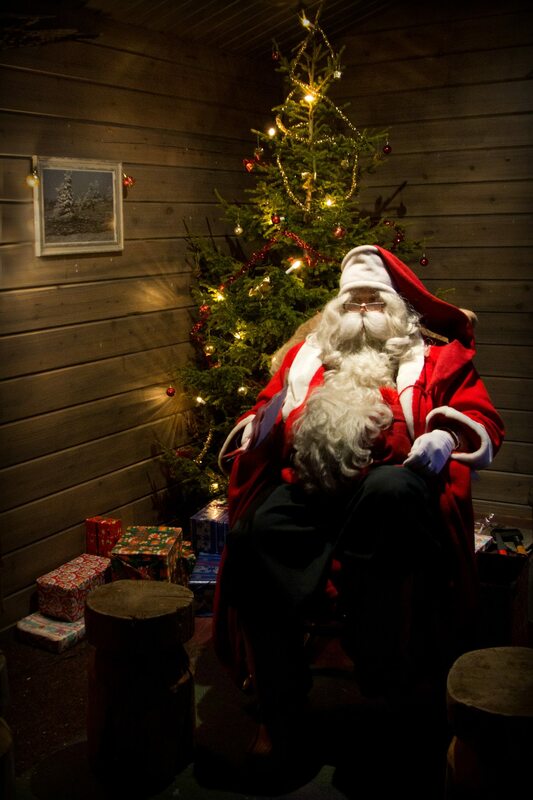 The kids were just transfixed when they saw the big man himself – their faces were a picture! Back at the hotel we were treated to a gala dinner full of lovely Christmassy food and festive games for the kids. We all received Arctic explorer certificates and our reindeer and husky driving licences. What a lovely end to a magical holiday." It was so lovely to meet the Nightingale family and I’m glad that they were able to come and see me here in Lapland. Danny and his family were accompanied by a journalist from The Sun who have written a lovely article about their trip to come and see me. It can be found by clicking here. For the latest news on Danny and his appeal don’t forget to check The Sun’s website.